Reading UK. December 21, 2017 – IGEL, a world leader in endpoint management software for the secure enterprise, today announced that Crisis, the UK national charity for single homeless people, is using its thin client terminals as part of the technology solution provided at nine Crisis at Christmas locations in London, its operational centre as well locations in Birmingham, Coventry, Newcastle and Edinburgh. It is expected that around 4,700 homeless guests will be supported by the charity this year during the nine-day festive and New Year period. The IGEL equipment is part of a total IT package provided to Crisis at Christmas by the Aimar Foundation, a charity founded in 2005 by IT staff from global financial services firm, Morgan Stanley, as part of its strong culture to give back to the communities it works in. Unfortunately, homelessness is still a major issue in society. According to research from Crisis, there are 160,000 homeless households in Britain today. 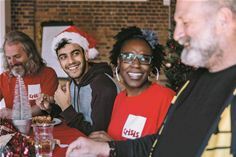 Last year, Crisis at Christmas centres served 32,267 nutritious hot meals, carried out 795 health screenings, repaired 605 items of clothing and delivered 1,463 advisory sessions. Around 10,536 volunteers gave up 240,960 hours to help. This year, Crisis will provide around 26 services to homeless guests ranging from counselling, hairdressing, dental and eye care, Internet Cafes – even kennels for pets. Centres are open from December 23 to 30, 2017. This is where Virtual Desktop Infrastructure (VDI) and thin client terminals come into play. The Aimar Foundation is providing Crisis at Christmas with a hosted desktop from Nasstar running Citrix XenApp. Around 320 powerful IGEL UD3 terminals have been lent to the Aimar Foundation which are optimized for multimedia applications. The system is secure, quick to set up and easy to remotely manage by Aimar’s core team of 15 staff and 150 volunteers who are helping to install and decommission the solution. This year, a whole range of other volunteer firms are assisting Aimar Foundation to do this including Google, Microsoft, Credit Suisse, JP Morgan, the London Stock Exchange, Vodafone, EE, Atomwide Managed Services, London Grid for Learning, Project Fusion, Everything Corporate, RDC and MoveIT. Guests will be provided all the normal Microsoft Office applications, Internet browsing, storage and Voice over IP. The latter is being delivered for free by Gradwell Communications. In addition, the system supports seven languages – English, Spanish, Polish, Russian, Latvian, Lithuanian and Romanian – and is configured to allow some-one working on a CV for example to then download files to a portable USB memory stick.